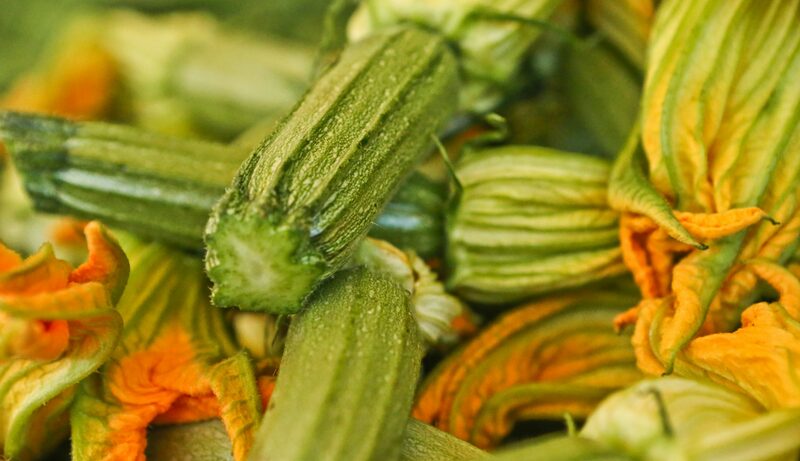 We select thick, fresh, juicy zucchini, ideally when they are in season (they are tastier) and not produced in a greenhouse. After washing them well and cleaning them, cut their flower and shave into large strips using a grater. Strain very well, frequently pushing down so as to get rid of excessive liquids and dry them faster. After zucchini strips have been drained, place in a large bowl and add one large onion finely chopped (preferably in a food processor), 2 eggs, toast crumbs (from “friganies”), a little bit of olive oil, chopped up parsley and chopped up mint for aroma, salt and pepper. Knead the ingredients so they may blend together and add large feta crumbles. While kneading in the feta cheese, ve careful not to dissolve it into the rest of the batter and try to maintain its shape and size (it is nice to find larger pieces of the cheese during the meal). Shape the batter into regular, meat-ball size balls or larger, then cover them in flour and fry in hot olive oil. After taking them out of the frying pan, place on paper towel so that the oil can be absorbed. Finally, place Grandma’s Zucchini Balls on a service platter and enjoy!